Do you remember the 2013’s American Psychological horror film Oculus? Yes, you are right. It is the story of two siblings and a haunted mirror. 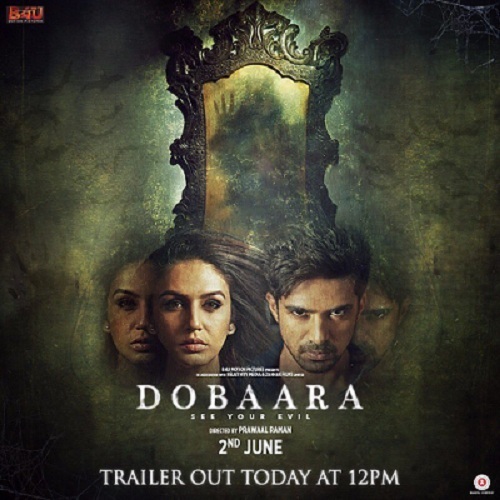 Now, the film remade into Hindi as Dobaara with a tagline See your evil. Oculus has created a sensation and turned out to be one of the scariest American horror films. Directed by Prawaal Raman, who earlier worked for Gayab, Darna Mana Hai, 404 Error Not Found and Main Aur Charles has remade this movie in Hindi. Anuj Dhawan is the cinematographer, and Arko Pravo Mukherjee has composed the tunes. Prawaal Raman, Ishan Saksena, Vikram Khakhar, and Sunil Shah are the producers for the film in association with Zahhak Films Limited, Intrepid Pictures, B4U Films, and Relativity Media. The trailer was released by the makers today, and it is nerve chilling. It starts with Huma Saleem Qureshi looking into the haunted mirror and found something wrong with it. In the role of her brother Saqib Saleem has made his appearance. Actors like Lisa Ray, Madalina Bellariu Ion, Adil Hussain, and Rhea Chakraborty played the major roles in this horror project. When coming to the story, it revolves around a mirror which is believed to be haunted by Huma, and she tries to prove everyone that the mirror is the reason behind the death of their parents, which happened a decade ago. The makers are planning to release it on June 2nd, and after watching the trailer, everyone is eagerly waiting for the release.